There’s just something so intensely satisfying about uncovering new-to-me spice blends, dried herbs that I’ve never heard of and so many colors of sea salt that it puts rainbows to shame. I’m sure it comes as no surprise, then, that my idea of a good time involves choosing a random spice blend from my pantry and then creating a whole meal around it. Lately, I’ve been borderline obsessed with Middle Eastern flavors and spices. I love how this cuisine pairs warm spices, like cinnamon, ginger and nutmeg, with savory dishes. How citrus is used to infuse bright flavor into each and every meal, and how vegetable-driven many of the recipes tend to be. For those of you just starting to delve into the world of Middle Eastern cuisine, za’atar is a great spice blend to stock in your pantry. 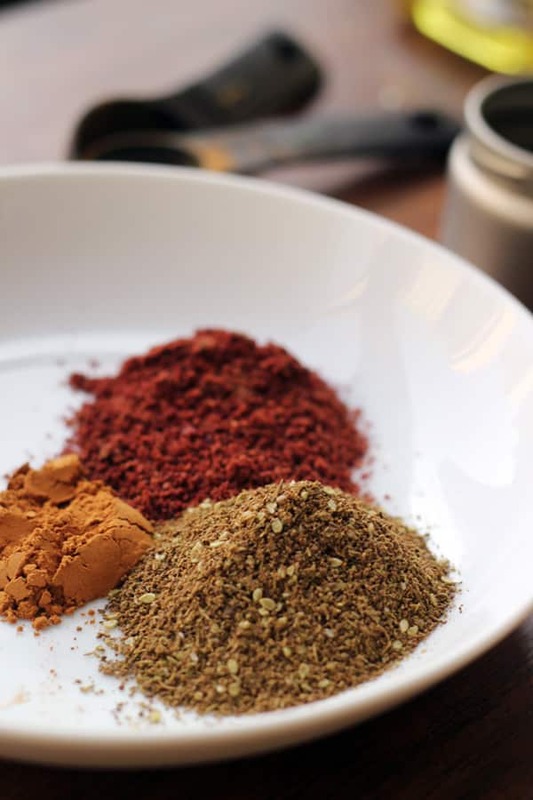 Not only does it consist mainly of spices you probably already have on hand (thyme, oregano, marjoram, sesame seeds and salt, plus sumac—more on that later), but its lemony, herbal flavor is great on just about anything. I love tossing it with vegetables and a bit of olive oil before roasting, but it is also great stirred into hummus or sprinkled atop a bowl of Greek yogurt. You can probably find za’atar at most higher-end grocery stores or order it online, but I chose to make it myself using this recipe. Sumac, which might prove a little bit harder to locate, is also a great addition to any Middle Eastern pantry. It is made from the dried fruits of sumac trees, and has a fruity, lemony flavor, but with less acidity. Again, most higher-end grocery stores should stock it, but if you’re really in a bind, you can always order it online (as I did, just to save myself the trouble of having to bounce from grocery store to grocery store in search of it). Alternatively, you can always substitute it with a mix of paprika and lemon zest, though the flavor won’t be exactly the same. Yotam Ottolenghi is a chef who has recently brought Middle Eastern flavors and cuisines into the mainstream, and given that every recipe of his that I’ve tried has pretty much blown my mind, when I saw that he had published a recipe for za’atar roasted chicken in a recent issue of Bon Appetit, I knew I had to co-opt it, veggie style. In place of the chicken, I chose to toss a head of cauliflower, a can of chickpeas and a thinly sliced red onion with Ottolenghi’s blend of za’atar, cinnamon, allspice, extra sumac, olive oil, and a touch of broth. After marinating the mixture for a few hours, I roasted it all together in one baking pan while preparing a bed of couscous pilaf and a simple parsley tahini sauce to drizzle on top. The dish is then finished off with a spoonful of brown-butter pine nuts that add just a hint of decadence to this otherwise virtuous veggie bowl. Couscous, chickpeas, and cauliflower seasoned with Middle Eastern spices then topped with tahini-parsley sauce and buttery pine nuts. The perfect meal for when you need a change of pace! Adapted from Bon Appetit. In a large zipper bag, combine the cauliflower, onion, chickpeas, za’atar, sumac, cinnamon, 1 1/2 teaspoons salt, vegetable broth and olive oil. Marinate in the fridge for 3-4 hours or overnight. When ready to cook, preheat the oven to 400°F. Pour the contents of the bag into a large baking pan and roast for 40 minutes, stirring once halfway through. Meanwhile, toss the cooked couscous with the olive slices and dried fruit. Set aside. To the bowl of a food processor fitted with the S-blade, add the garlic, parsley, tahini, water and lemon juice. Process until smooth, then season to taste with salt. Set aside. Add the butter in a small pan over medium heat and heat until melted. Add the pine nuts and cook, stirring constantly, until starting to brown, 3-4 minutes. Transfer to a small bowl. Divide the couscous among serving bowls and then top with the roasted vegetables, a drizzle of the tahini-parsley sauce, and a spoonful of the pine nuts. Prep time includes the hands-off time spent marinating the vegetables. Oh I have TOO much cauliflower in my fridge needing some attention! I love middle eastern spice as well – this sounds great! Thanks for sharing! These Middle Eastern spices bring out the earthy flavor of cauliflower super well! I hope you enjoy it! This is gorgeous and looks so delicious! Thanks so much! It’s a new favorite use of za’atar for me! Wow, this sounds and looks absolutely delicious! I can’t wait to try it. Thanks for making the veggie version and posting it for us to try. Not a problem! I love seeing how I can change up meat recipes to make them veg-friendly. This is my kind of dinner – so delicious! Yotam Ottolenghi has fueled an obsession with Mid-East seasonings for me too. This looks wonderful. I enjoy zaatar and am always looking for more ways to use it. Thanks for sharing. That man is a GENIUS with spices and veggies. You will love this! This looks delicious. I love anything with za’atar! Sooooo good! It’s such a great spice, right?! I’m always looking for new ways to use it! This looks delicious! Have you ever tried Israeli cous cous? I love the larger pearls — definitely a bit chewier, but I think better than the small cous cous! Try it! I have tried it! It’s a favorite, for sure, and could probably be substituted here in place of the couscous by just extending the cooking time! I love how different this sounds! I had zaatar french fries at my fave restaurant the other day (drool) and I’ve been craving zaatar ever since! This is just perfect. Pinned! Oooo za’atar french fries are something I need to try! Joanne! You’ve done it. I’m SO making this. Seriously, everything about this dish screams my name and I just so happen to have every ingredient (down to the pine nuts!) on hand. Thanks for this glorious recipe! Haha thanks girl! I definitely think you would enjoy this. Let me know what you think if you try it! Oh, now, that is an interesting combination. Adding this to the weeks menu…thanks! Really need to make this asap! I haven’t even tried za’atar yet because I wasn’t sure what it was. These are all of my favourite flavours 🙂 Also, za’atar is kind of fun to say! When I saw this recipe, I knew I HAD TO make it. 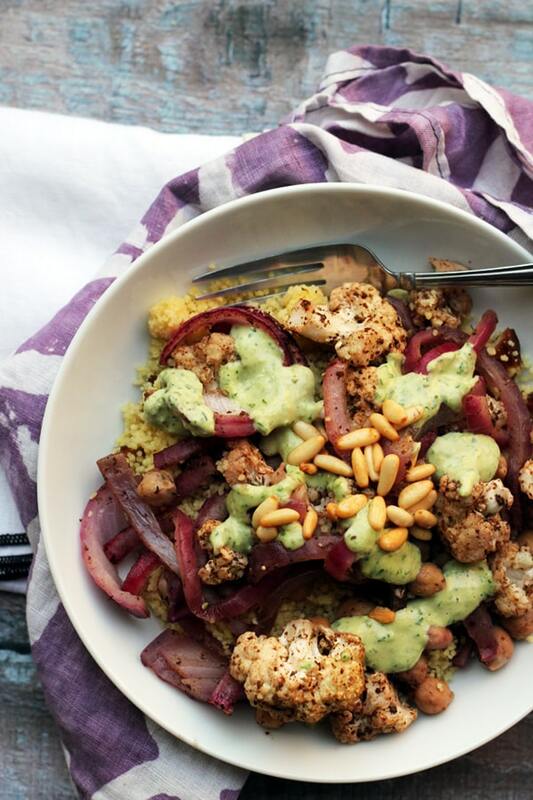 I mean, dreid fruits and olive couscous with roasted red onion, chickpeas and cauliflower, zaatar, tahini/parsley sauce, this is just too perfect to be true! I had it for lunch today and it was as delicious as expected! I just cut down the proportions fot the sauce : even though I only made half of it, I now have a full jar of dressing (which, really, does not bother me! I’ll be using it in my other salads 🙂 and I found it was too thick to my taste so I had to double the quantities of water (if not more). But I had an awesome lunch all the same, I’m definitively keeping this recipe in mind! Thanks for sharing! Tried this tonight, and my wife and I loved it. Thank you, and can’t wait to try your other recipes. We made this last weekend and it was wonderful! Makes great leftovers. Wow. I almost NEVER follow recipes to the T, because frankly, they are generally wrong. However, this had such a crazy variety of ingredients of things that I had, so I did it and didn’t question it. I used dates for the fruit and almonds instead of pine nuts. Everything else was exactly as told. I am thoroughly impressed. It’s hard enough to find a good recipe of top, healthy ingredients. It’s even harder to find a recipe that has the perfect measurements to boot. Way. to. go. I loved this, especially the sauce. I omitted the raisins to accommodate a picky eater, and I skipped the pine nuts to accommodate my own pickiness — otherwise I followed the recipe to the letter. Can’t go wrong with roasted cauliflower, and oh my goodness that lovely parsley sauce! That’s the great thing about cooking, you can always adapt to picky eaters. Glad you enjoyed this recipe!